If you want more than just a tiny stud in your nose, consider getting any type of double nose piercing. From side-by-side to septum and nostril, there are several types of double piercing options available for the nose. A single stud or ring in one nostril is the most common form of nose piercing, but hardly the only one. While the nose is not the largest area on the body to be pierced, dual nostrils offer a number of nose ring placement opportunities, including the ability to have two rings at once. While this may not sound like a large number of areas, keep in mind that most nose piercings are fairly thin gauge. This means that when care is taken in initial placement, it's possible to double up a piercing. If you want something that will stand out more than a single stud, consider any of these choices for noise piercing options. 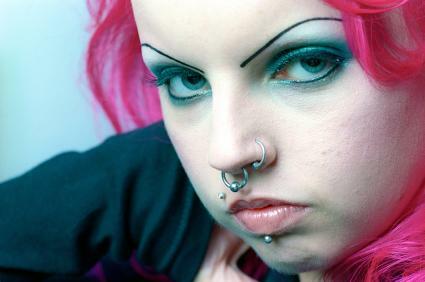 Consider placing two piercings directly next to one another on the same nostril. This can be two rings, or two studs. Keep in mind that rings need less space than studs; if you plan on switching out your nose jewelry, give some thought to how far apart you want to space the piercings. Placing one near the tip of the nose and one near the cheek gives the most options, while placing them close together can have a more subtle affect. If you enjoy symmetry, consider getting one piercing on each nostril. This balanced look can be mixed up with two rings, or a ring and stud. Be sure to have the position of each hole carefully measured so the jewelry truly balances. The septum piercing is more extreme than the nostril and can take longer to heal because you're piercing a thicker band of cartilage. Once healed, though, it can be an impressive spot for a piercing with the ability to use bull rings, retainer clips and curved barbells. Complement a septum piercing with a smaller, well placed nostril piercing. For the most cohesive affect, be sure to choose jewelry from one design style. The septum doesn't have to be pierced directly in the center; the piercing can be made anywhere from front to back. Consider getting two holes, one directly in front of the other to double the effect. Nose piercings take two to three months to heal. Allow one piercing to heal completely before getting a second adjacent to it to minimize the risk of infection. 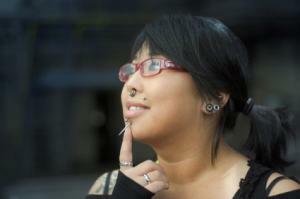 Keep an initial nostril piercing to the front or back of the nose. This allows the most room for a second piercing to join it. Take careful measurements to ensure a piercing on either side of the nose balances evenly. Keep in mind that faces aren't always perfectly symmetrical or even and make adjustments as needed. When you pay close attention to the details, a double nose piercing can really make your facial jewelry pop. If you want more options for rings and studs, don't search for another area of the face; the nose has all the area you need.